It’s funny how all my well-meaning efforts to eat healthier are suddenly trounced by a single haphazard option. Like with this particular lunch, for instance. Observe. Fresh asparagus spears, stir-fried in a little olive oil and lots of garlic. Fresh veggie, check. Healthy oil option, check. Lots of garlic—definitely good for the heart. Check. Followed by shrimps in soy sauce. While shrimp may be a bit high in cholesterol, it’s low in saturated fat so it’s still a better choice over, say beef or pork. Plus, I cooked it in very little oil so that’s still a plus. And then my rice. Organic brown rice must be good for you. Right? RIGHT? Watch me fail as I take leftover organic brown rice, uber healthy for its high fiber content, and saute it with a little bit of ALIGUE! Aligue is the fatty crab coral (the spongy solid, orange part) and crab butter (the yellow fat under the shell). Uber loaded with cholesterol, this deadly delight is so rich and flavorful and I’d gladly suffer later, if only to please my tastebuds for the moment. All my efforts to be healthy, traded for one glorioius tablespoonful of Claude Tayag’s Taba ng Talangka (Fat from tiny shore crabs). Ah heaven. Sometimes, you really just need to throw caution to the wind and live for the moment, don’t you? 1. Heat olive oil in a shallow frying pan. 2. Add garlic. Saute until fragrant but not yet browned. 3. Add asparagus. Saute until bright green in color but not overcooked. If you’re not used to cooking asparagus, it’s best to try a piece. It should be crisp to the bite but not raw. 2. Put oil in a pan. Saute shrimp in oil until it begins to become pink. 3. Add the prepared sauce, making sure to saute quickly to coat the shrimp well. 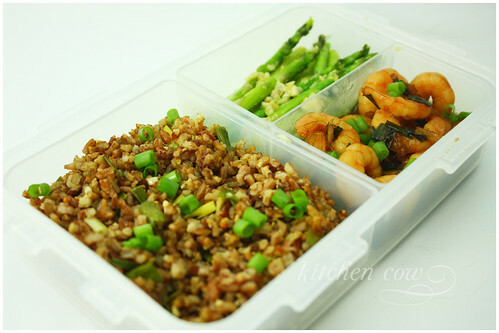 This entry was posted in bento, recipes and tagged aligue, asparagus, bento, brown rice, chinese food, crab fat, filipino food, garlic, obento, olive oil, organic, pinoy food, recipe, taba ng talangka. Bookmark the permalink. Aaaaah, nagutom ako when I saw this! And I agree, satisfy them tastebuds! Hahahaha ah well. Brown rice never had it so gooooooooooooooood. this looks really good. i should probably get with the program and start eating brown rice. the rest looks yummy. can i get the aligue from local grocery stores? (we’re going to manila in april and i am trying to systematically plan everything!) how different is claude tayag’s from other brands? i remember getting a bottle from a filipino store here and since i never had bottled aligue before, i didn’t have anything to compare it to, so i guess for whatever it’s worth, ok na rin. Aligue. Taking the health out of healthy brown rice. i’m just wondering if the asparagus is still crispy after a few hours your lunch box is covered. is there a way to preserve its ‘freshness’? Yes, it stays crispy. At least in my experience, as long as you don’t overcook it, it retains a nice crunchy texture. This dish looks exquisite. I am now in the mood for some brown rice and asparagus. I have to run to the bank but as soon as I get back its a healthy breakfast for me.